Boy Scout Pack 614 Going Strong! 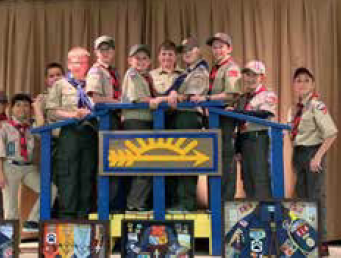 It is my pleasure to share that Cub Scout Pack 614, which is chartered by our Lodge, is alive and thriving! We serve about 60 youth in Kindergarten through 5th grades. We just “bridged” 11 Cub Scouts from our Pack into local Boy Scout Troops as they earned their Arrow of Light award and move forward on their Scouting adventure. The Pack also held their annual Pinewood Derby race at our Lodge last Sunday, March 10th! We had about 40 cars entered and it was a lot of fun! 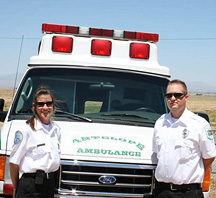 The Lodge also hosted the Annual Antelope Valley District Dinner. We recognized three adult leaders with the District Award of Merit and one young 7 year old Cub Scout for the National Heroism Award. This young Cub Scout, Sean Malbrough, found his Grandfather unresponsive on their kitchen floor and had the presence of mind to call 911, remain calm, lock up the family dogs, and let the firefighters into the house to help. His Grandfather made a full recovery, thanks to this young man’s presence of mind and training in Cub Scouts. 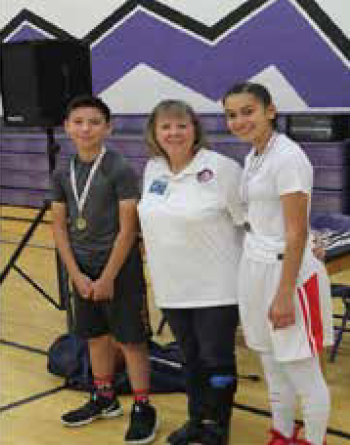 This year’s Hoop Shoot was held at Armargosa Creek Middle School in Lancaster. While we had a very small turn out, it was fun for those who showed up! (It meant more coffee and donuts for me!) Here is a big THANK YOU to the A.V. Sea Cadets who came out to perform our opening ceremonies. They did a wonderful job presenting the colors! Thank you to Sheila, Sharon and Bernice, our registration ladies!! Thank you to Referee Jerry Sheridan and score keepers Bill Brehm, Stan Foster, and Jay Jenkins! Thank you to the young ladies of future Troop 76 – Heidi and Kaylee for shagging balls. Thank you to anyone else who came out to help, even if not mentioned by name! We couldn’t have done it without you! I feel the need to mention that if we had had a bigger turn out of youth, we would have been in BIG trouble. We had so few Elks in attendance that we would not have had enough volunteers to score both the boys and the girls at the same time. It is really a shame that we didn’t get more participation. The kids who come out work really hard to do their best and we should show up to support them! 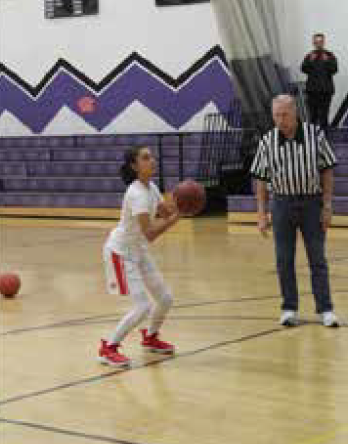 Hoop Shoot is one of the few required events and a big part of the tradition of the Elks. We hope to see you next year!! "Attendees and volunteers were in a jubilant mood at the well attended 47th "Childrens Annual Halloween Party." Our Cub Scout Pack #614 is doing really well. They have opted to become a “family pack and will be including all girl Dens into the Unit. I know many people believe that Boy Scouts of America should remain boys only, but let me share my opinion… many of the siblings have been going to, and participating in, the same program for many years, but they haven’t been able to get the recognition just because they are female. The restructuring into Scouts, BSA now opens the program so that ALL youth can benefit from it and the young ladies will get the recognition they deserve for their participation. I would be totally against it myself if the units went coed. At the Cub level, grades K-5, they are in separate dens. At the Scout level Grade 6 and above they will remain in separate Troops. Boys will be only with boys and have their much needed guy time. Girls will be in all girl units, allowing them to get the full benefit of the program and its life and leadership skills. I am happy to say that I am very excited to be part of the first Young Ladies Troop and am thrilled that our Elks Lodge has offered their support for Scouting through the use of the facilities as needed. We had a Meet-n-Greet event on October 12th and had 4 girls come & find out about Scouting. 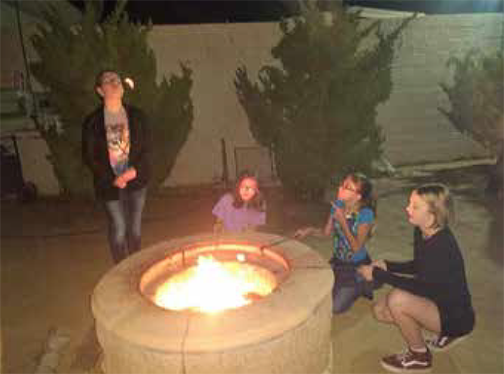 They had a campfire and made s’mores, played games and really just had a fun evening. Thank you, Lodge #1625, for your support! Your weekly Good of the Order donations are used for just two thing, helping Elks in distress and the Jr. Livestock Auction at the A.V. Fair. Each year, the community comes together to support the youth who raise animals in our area. 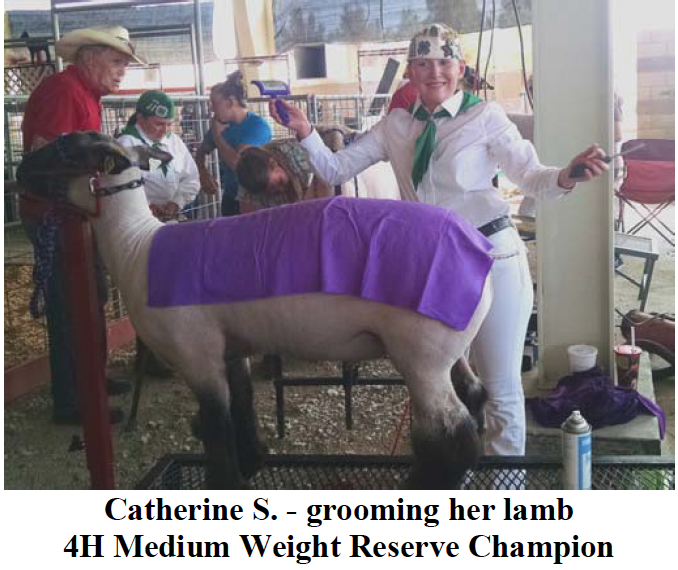 They come from independent families, FFA clubs at local High schools, Grange and 4H Clubs. The kids choose and raise animals, handle all their care (feeding and grooming) and then solicit buyers to come to the auction. This year, our Lodge was able to purchase 4 animals. We then have them "bought back" by the slaughter houses and the monies all go back to the kids to cover their costs. This is an amazing learning experience for the youth who participate. It was very educational and emotional for me as well. We had a family with three kids come in to the Lodge and submit a "buyer's letter" for us to consider their animals. Each of them had a market swine. We were able to donate some money to each of them. We had several others who sent letters requesting us to consider their goats, lambs, and steer. Two young ladies from Quartz Hill 4H Katherine S. and Kayla S. came in and had a formal meeting with the ER and I to discuss their plans, their experience and submitted a letter. We purchased a lamb from one of those young ladies. Thank you to Barney Williamson, PER & Johnny Costa for going with ER Bill Brehm and I to the event! (Bottom Picture) Since it was my first, and Bill's second time, it was nice to have some experience behind us! 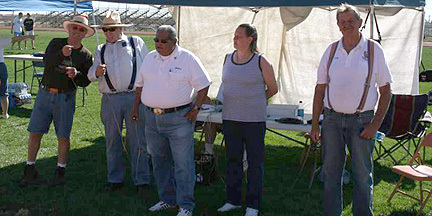 At the May 20, 2014 Elk's meeting, the Antelope Valley Sea Cadets presented a ceremony prior to the meeting. During this ceremony, very much to his surprised, Nancy Jo Costa (ER) presented Cadet Petty Officer 3rd Class Nicholas Finks with a $2,000 scholarship from the Lancaster Elk's Lodge #1625. Also presented to him were a Certificates of Recognition from R. Rex Parris, Mayor of Lancaster (presented to him by Sean Hickey, Leading Knight), Senator Steve Knight (representing Steve Knight was Issac G D Barcelona, District Director, Senator Steve Knight 21st District) and Supervisor Michael Antonovich of the County of Los Angeles (representing Michael Antonovich was Norm Hickling, Sr. Deputy To Supervisor Michael Antonovich of the County of Los Angeles). 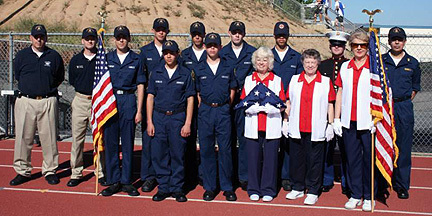 Cadet Nicholas Finks will be graduating from Quartz Hill High School this month. 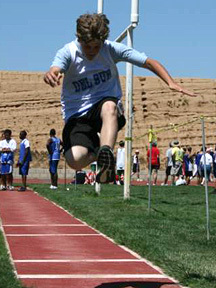 In July, he will attend the Naval Academy. Our 62nd Annual Invitational Jr. Youth Olympics cancelled? Yes, it is a shame that something like this can happen after all these years. Due to budget retraints by the California and the U.S. 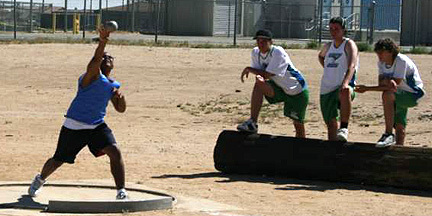 Governments, our twelve middle schools in the Antelope Valley could not participate in this annual event. 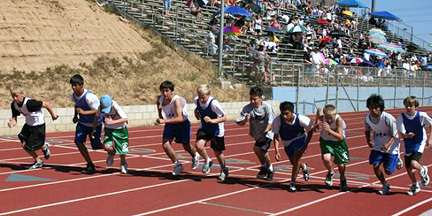 The purpose to have this annual event was to give these students an opportunity to compete between the schools. Otherwise they wouldn't have had this oppotunity to compete among themselves. 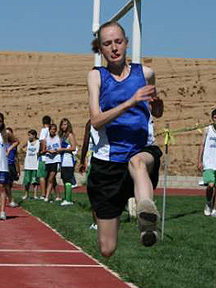 The schools and children always looked forward to participate every year. 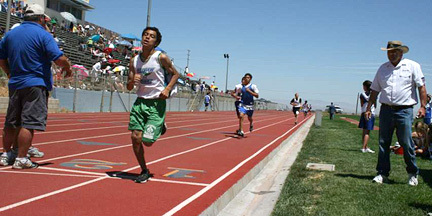 Mainly it has encompassed all track events from the 100 meter dash, up to the 1,000 meter relay and run. 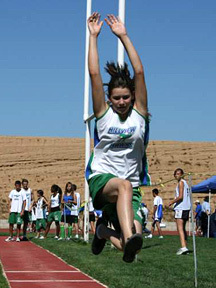 It included in-field events of the high jump, run and jump, and shot-put. 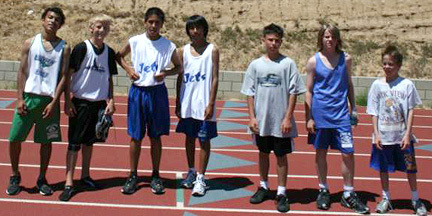 This has always been open to all our Antelope Valley Middle Schools for both Girls and Boys. More than 40 volunteers from the Lodge gladly give up the second Saturday of May to put this event on every year. 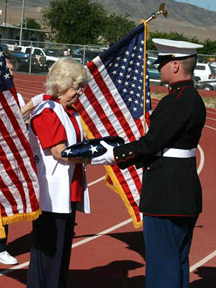 In addition, the Ladies of Lancaster Emblem Club #76 traditionally held the opening flag ceremony. Our own Naval Sea Cadets (see our Links Page) and others have gladly volunteered to help. It appears that our public and independent schools are losing interest in participating in our Elk Events, such as Soccer and Hoop Shoot. "It's a Shame!! 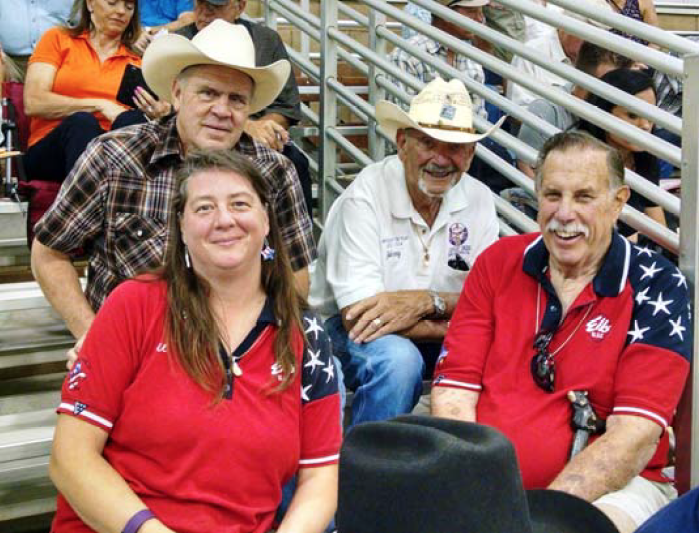 Elks do Care - Elks do Share! 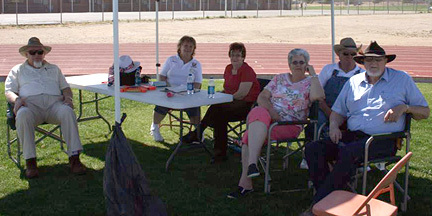 Since the beginning of the Annual Invitational Junior Youth Olympics Track Meet in 1948, the event has continued to be one of the most popular sponsored, hosted, and operated by the members of Elks Lodge #1625 in the Antelope Valley. This year was no different. 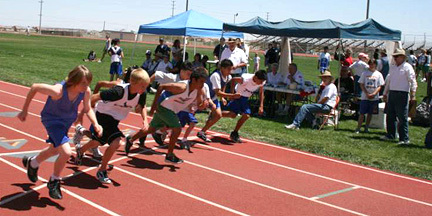 On May 9th, 2009, Elks Lodge 1625 hosted the 61st Annual Junior Youth Olympics at Quartz Hill High School athletic field. 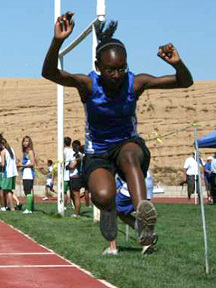 This year eight separate middle schools competed in today’s events. 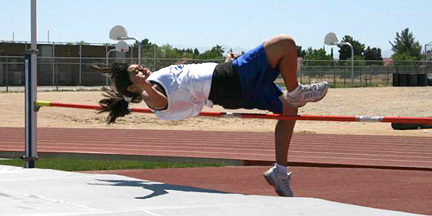 This has given the middle school 7th and 8th grade boys and girls a chance over past years to compete in inter-mural track and in-field events. 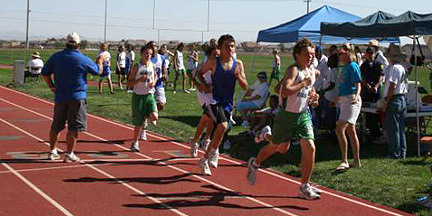 The track events included the 4X400 Meter relay, 1600 Meter Run, 200 Meter Dash, 400 Meter Dash, 800 Meter Dash, 100 Meter Dash, and the 4X400 Relay. 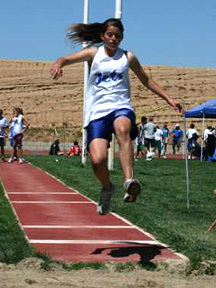 The in-field events included the Long Jump, High Jump and Shot Putt. Records continued to be broken from previous years. This event today was put on by 54 Elk volunteers and friends who traveled approximately 1,433 miles and devoted approximately 340 hours of their time. The day’s event started out with the flag ceremony conducted by the Emblem Club #76 ladies, our own US Naval Sea Cadets, and PVT Michael “Mike” Grubbs, USMC, from 29 Palms, CA who raised and lowered our flag. 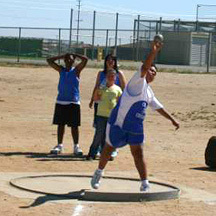 Eight middle schools from throughout the Antelope Valley competed this year with approximately 348 competitors taking part. 8th grade Vanessa Lopez from Endeavor Middle School broke all past school records in the 800 meter run with a running score of 2:34.31.We are very proud of these youngsters and their accomplishments. volunteerswho Make this event possible! Contestants this year were exceptional!